Meet Wilson Davenport – call him Willy. 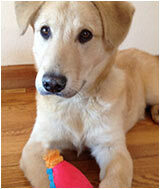 Wild Willy is a 7 month old Lab-German Shepard mix – might even have a bit of Golden in him ’cause he’s so sweet. Willy D leaps a lot when he’s happy, and on his first walk Downtown he leaped all the way down Main street. In addition to raising Wilson, his mom, Marilyn, is a member of the Board of the DBA and handles the PR and Street Faire sponsorship. Built in 1894 as the “little red brick school house” it housed 1st and 2nd grade classes until about 1920. It has also served as the town library in the 1940’s, a recreation center in the 1950’s and 60’s, and the town senior center in the 1980’s. The bell tower was removed in the past and the current replica was installed in 2004. As promised, first look at this summer’s lineup is for you, you awesome Downtown Dialogue subscribers. Let’s get this party started! Shop the new Spring/Summer line of clothing gifts and decor and enjoy savories from Mudrocks Tap & Tavern. 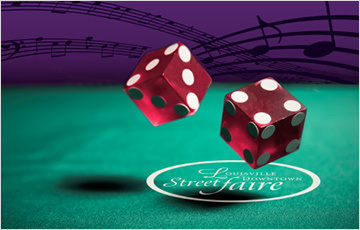 Register to win one of four $25.00 gift certificates. 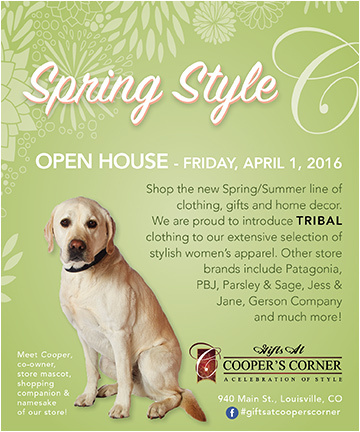 Check out all the great brands including Patagonia, PBJ, Jess & Jane, and introducing the shop’s newest line from TRIBAL. Cooper will be waiting for you! Each year we get a wonderful opportunity to see the talented works of the LAA members. 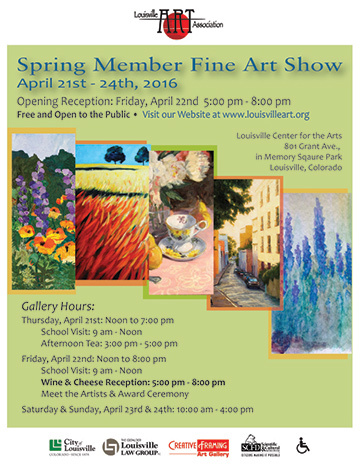 The show kicks off Thursday, and a Wine and Cheese Reception will follow on Friday, April 22 from 5:00 – 8:00 pm. Various Gallery hours throughout the weekend, so check the LAA website, www.louisvilleart.org. Free and open to the public. Over 75 people have attended these networking nights where you get a chance to meet and greet other folks and see what cool things some of our local businesses have to offer. Register to win a KindleFire 7 and other fun door prizes. Enjoy some delicious food from Smiling Moose, Double D’s Pizza, Jules Gourmet Catering and Nothing Bundt Cakes. Be sure to bring your friends! Zucca has a new executive chef, George Jackson, and to introduce him to the community the restaurant is presenting their first Seasonal Chef’s Table. The Seasonal Chef’s Table is a quarterly, limited seating dinner that that features the flavors of each season. This first one, for PRIMAVERA, is on Tuesday, April 26. Space is limited and reservations are required. Come meet the new chef and enjoy his inspirational creations. Zucca also offers Wine Mondays where all bottles of wine are 20% off and they have just started an amazing new Happy Hour with $3 beer, wine and small plates. 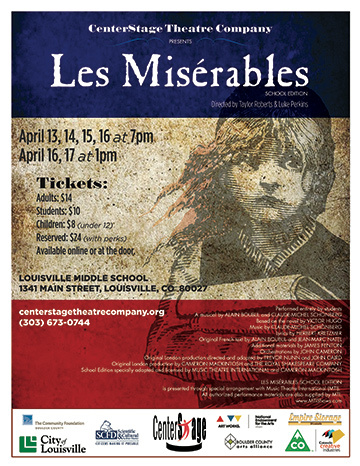 One of the most iconic musicals of the 20th century comes to Louisville when CenterStage Theatre Company presents Les Misérables. More than 70 talented young actors from across the Front Range bring Victor Hugo’s incredible story to life in this exciting production. 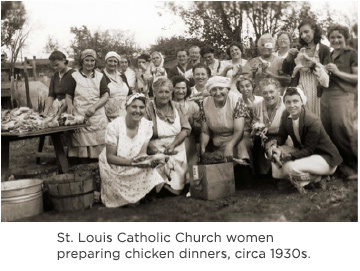 The Museum will present a series of programs based on the theme of Louisville’s Larder, which features agriculture, restaurants, the history of Italian influence on the local food culture, and a look at a typical family’s kitchen, garden, and larder. Did you know that our national colors are red, white and blue because of the Early American textile industry? Do you know why purple is associated with royalty? We easily associate specific colors and designs with countries, people and holidays, but you may be surprised to learn that a lot of these connections are due to ancient and historic textile processes. 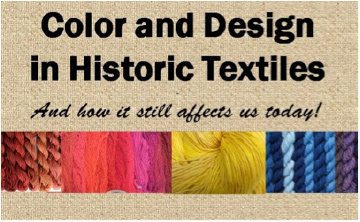 This presentation will delve into the development of color and designs of textiles, but we will also look at how it still relates to our lives today. While nearly everyone has seen pictures of the World Trade Center collapse in 2001, and many know stories of someone affected by the tragedy, few have heard any details about the steel that formed the structures, and the process that led to the collapse. 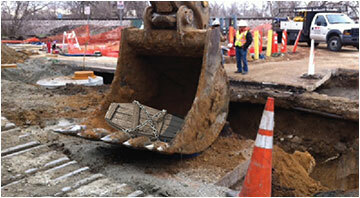 In 2002, the National Institute of Standards and Technology (NIST) was commissioned by Congress to investigate the structural and materials issues behind the collapses. This presentation by Dr. Tom Siewert, a retired member of NIST, will summarize the data collected between 2002 and 2004 on the behavior of the steel and the welds that framed the building. Learning the TEN RULES of personal finance as a teen, or adult, will help you have a more rewarding life. Elliott Moran of Community Financial Credit Union will teach you how to save and how to spend money to ensure that you have money to make college affordable, prepare for emergencies, pay off debt, boost your retirement fund, and save for experiences that will help you lead a less-stressful and more fulfilled life! One Action 2016: Arts + Immigration Project is designed to engage and inform county residents about the historic and contemporary issues of immigration through the cultural arts. This program is limited to 10 participants, 8-12. Pre-registration for each session is required.